I started playing City of Heroes back in August 2004. At that time the game had not been released the the EU so I, like many other European gamers, downloaded the US version of the game and played on the US servers. Nearly a year later City of Heroes finally recieved a European release, I didn't join the EU servers because of the friends I had made in-game and at the time doing so would mean starting over completely from scratch, abandoning the characters I'd spent the best part of a year building. A further six months down the line City of Villains was released, along with a character transfer facility, allowing European gamers on the US servers to copy their characters onto the European servers if they so wished. After a brief flirtation with the European servers thanks to a European community programme that rewarded those who ran fan sites such as mine with free subscriptions to the game I returned to my home on Infinity server. 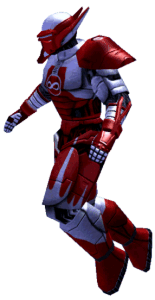 At one point I spun out "Red Tomax's Guide to City of Heroes" into it's own domain (redtomax.com), at it's peak the advertising on the site just about covered the running costs of the server and my City of Heroes subscription. After a couple of years away from the game I decided not to renew the domain registration and re-integrated the content into nofuture.org.uk. I do find it kind of funny that squatters continue to pay for that domain name to run their link farms, presumably unaware that it's only value relates to a virtual character I created in a video game back in 2004. I can imagine inquisitive minds in years to come wondering "why the hell are these guys running a link farm on redtomax.com? What is a redtomax anyway?". I see it as a lasting tribute to the greatest super hero Paragon City ever knew, his name will forever live on although only very few will understand it's origin. City of Heroes closed it's doors in November of 2012, although I had long since hung up my cape I look back at my time in the game with nothing but fondness.